The 'Kratos w/Snaps' Custom Leather IWB Gun Holster by Soteria Leather is the same design as the the Kratos w/Chicago screws, except for the Snap-closure. This IWB is not only comfortable, it is the ultimate in handgun concealment. 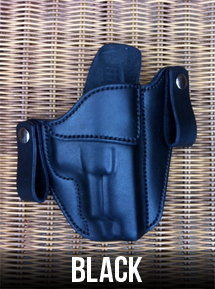 It is designed to ride somewhat higher on your waistline than other IWB Holsters, and therefore it 'stays put', and rides close to your body. Why Snap-closure and not Chicago screws' This option is for you, if you prefer to tuck your holster into your waistband first; and then, wrapping the straps around your gun belt and snapping them in place. 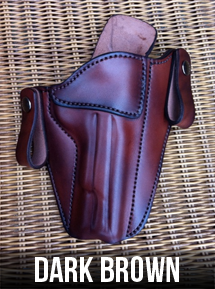 Your custom holster will ship in eight to eleven weeks. Note: If you prefer to slide your holster onto your gun belt before tucking it into your waist band, check out The 'Kratos w/Chicago Screws' Custom Leather IWB Holster by Soteria. 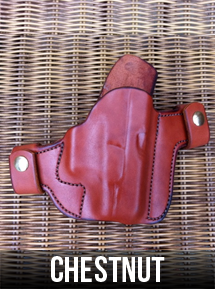 You will find your options in the Custom Holster category. The Name: Kratos was the spirit of 'strength, might, and power' in Greek Mythology. 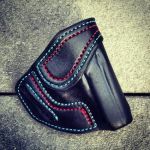 The 'Kratos w/Snaps' Custom Leather IWB Gun Holster by Soteria Leather is available for the following handguns and more. Please check the option list! 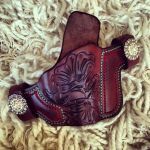 NOTE: A second row of stitching is an option for Soteria Leather's Custom Holsters. The picture is just showing an example of the stitching.